Flower Child, located inside Chatswood Westfield, is a cafes that is just beautiful. I think that when I pass it and I think that when I see images of the food on Instagram. After having it on my to do list for a few months, some members of our team decided we would try it on Friday as a Foodie Friday adventure (my original suggestion for the name of the day was Fat Fridays but apparently that was guilt inducing). We decided to try and beat the lunch time rush and arrived at Flower Child at 11.45 but still had a five minute wait to get a table inside the café. Once seated you could really notice how pretty is was despite being inside a shopping centre with the roof covered in artificial plants. After a thorough read of the menu and a stalking of Instagram I had arrived at the café desperately wanting to try the waffles despite it not being a proper lunch option. 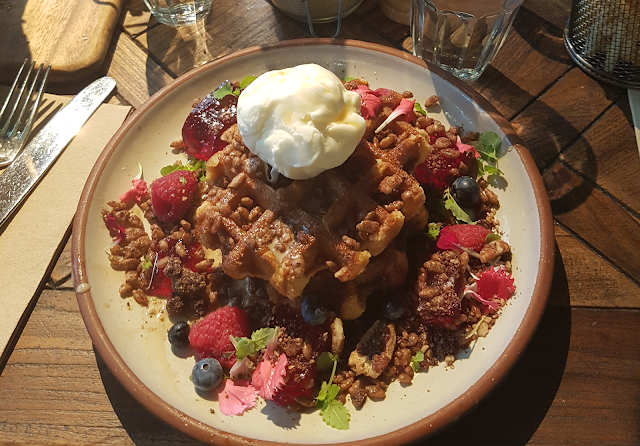 I had seen images of the waffles served with a coco pop anglaise, fresh berries, fresh and dried bananas, raspberry jelly and a scoop of ice cream online and thought it look like such a pretty dish and the coco pop element intrigued me. It was a bit of an internal battle whether I go for the waffles and I decided that if they could serve it without bananas it was meant to be ( I hate the taste and texture of bananas) and thankfully that was no issue at all so waffles for breakfast it was. My team mates all ordered burgers that came with a side of fries. True to what we had seen online, everything was presented beautifully with the burgers being served on boards and my waffles beautifully served up with flowers. But looks can only take you so far when it comes to food and I must say the waffles were tasty and I did not regret my choice. The coco pops added a nice crunch and the berries cut through the sweetness. The jelly, although added a nice colour to the dish probably pushed the sweet level too far. The waffles themselves were fine, not amazing but nothing to complain about but paired with the other elements is what made it stand out. The girls said although their burgers were nice it did not blow them away and they did have high expectations that Flower Child food would do that. So although I wouldn’t rush back for the burgers, I thought the waffles were creative enough to bring me back to try their other offerings.